ABNER MARES: "I AM GOING TO EARN MY FOURTH WORLD TITLE IN BROOKLYN ON SATURDAY, JUNE 25"
LOS ANGELES, Calif. (June 9, 2016) - Abner Mares, the former three-division world champion boxer, will be taking class, technique and power into the ring when he meets WBA Featherweight World Champion Jesus Cuellar on Saturday, June 25 live on SHOWTIME CHAMPIONSHIP BOXING on CBS presented by Premier Boxing Champions from Barclays Center in Brooklyn, N.Y. Live coverage begins at 9 p.m. EST/6 p.m. PST. Mares returns to the ring after a loss in one of 2015's most-watched fights against featherweight world champion Leo Santa Cruz. 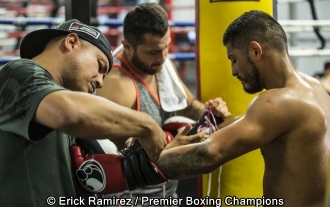 In 2016 Mares changed his training camp to work with former world champion boxer and two-time "Trainer of the Year," Robert Garcia (Mikey Garcia, Antonio Margarito, Marcos Maidana) out of his Riverside, Calif., facility. Mares has continued to work with his longtime strength and condition coach Luis Garcia (Andre Berto, Amir Khan). His fight against Cuellar not only marks his first fight of 2016 but a chance to capture a fourth world title. "This is going to be a technical fight," said Mares. "Cuellar is a hard-hitting fighter and since the fight was made we've been preparing for a real battle. I have no personal vendetta against him, however I am excited to see what monster the Mares-Garcia combination has created and gets unleashed. My power and spirit are 1000 percent. Fans are going to see a fantastic, clean, technical fight." For Mares' fans the direction under the guidance of Garcia brings new possibilities for the fighter, and one that Garcia sees as the next step and progression for Abner. "I've been seeing the Abner that the world knew three to four years ago," said Garcia about Mares' training. "A warrior with tremendous boxing skills, that's the Abner I see now. He's in tremendous shape but it's a different Abner. He's been a warrior all his life and he will come to fight - he has that mentality - but his jab, his straight punches and footwork are better than what fans have seen in the past two years." "It's my first time fighting and being in New York and I plan on giving the fans at Barclays a 'Fight of the Year' performance," he said. "New York is the home of the American dream. Being a Mexican who came to the U.S. as a young child, it's hugely symbolic for me as well as my family. This is my chance at winning my fourth world title and to do it in the city that started so many dreams and careers and on the first primetime fight on CBS in almost 40 years, it's an important moment." "I've been training with Robert since December. When the original March fight was postponed and I had a chance to fight Cuellar for the title so we never really took a break. We did change our training regimen a bit to stay fresh, get stronger and work on some tactical and technical skills. Robert has a great eye and knowledge of the sport, having worked with so many fighters, including Cuellar. It gives me an advantage in preparation." "I knew I needed to change my camp after the last fight. I felt that we had a solid camp but in the end, I didn't stick to the plan and it resulted in a loss. I am a warrior, I'll never give up, always come back. I am not afraid to take a fight. But I knew I needed a trainer whose plan I would have to follow versus having a trainer who would fit into mine. Robert and I come from similar backgrounds, his record speaks for itself and I know this partnership is going to deliver big wins." "Abner is very candid as a boxer. He has great skills in speed, footwork and power -- he has all three and when combined he's unstoppable. Sparring has been tremendous and if he does exactly what he is doing in gym and follows instructions then he can compete against any top featherweight in the world in my opinion." "Abner's a beast. He's doing great in our sparring sessions - his power is tremendous and his boxing has just become more effective. He's always been a tremendous fighter who can box inside and on the outside. What the world saw and loved from him in August - his heart and ability to get in and fight - has been focused and strengthened. We're very focused on winning and beating a hard-hitting fighter."